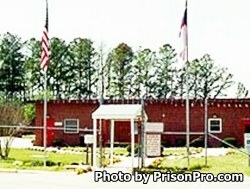 Sanford Correctional Center is located in Lee County North Carolina. It is a minimum security prison that houses 298 adult male inmates. Most offenders at this facility work jobs both on and off prison grounds. Select inmates are granted work release which allows them to report to a job during the day and return to the prison at the end of their shift. Inmates are housed in open dormitories. Religious studies, and substance abuse treatment programs are available at this institution. Sanford Correctional Center provides work opportunities for inmates that include road crews, recycling crews, culinary duties, landscaping, and custodial work. Inmates can also receive an adult basic education and obtain a GED while incarcerated here. Visiting at Sanford Correctional Center occurs on Saturdays and Sundays 11:30am-1:30pm/2pm-4pm and utilizes a rotating schedule. The schedule rotates monthly and is based on the first letter of the inmates last name so you will need to call for the current schedule.